Though the houses were built with the intention of relieving overcrowding in inner London, the number of rooms available and the size of them still meant that families were crammed together. Brothers and sisters sometimes had to share a room even in teenage years, while just finding the space to sit and eat together could be difficult. People who had grown-up on St. Helier were not allowed to apply for a house there. By the 1950s, many young married couples were living with their parents on St. Helier. This was brought about because of the acute post-war housing shortage and the fact that the LCC would only allot the estate houses to people who had come from inner London. Those children who had grown up on St. Helier and looked upon it as their 'home town' were not allowed to take on a property there. This could eventually lead to three generations living in one house. 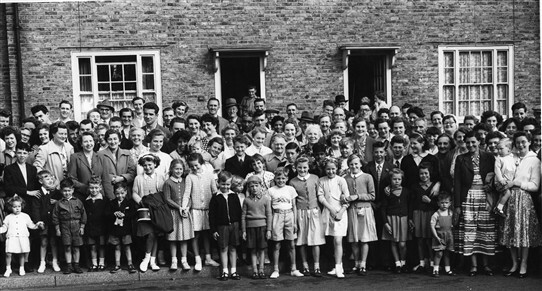 In 1963, St. Peter's parish newspaper, The St. Helier Herald, started a campaign to persuade the Council to allow families to stay together on the estate. They labelled St. Helier as a the 'One generation transit camp', and questions were even asked in Parliament about the problem. This page was added by Cheryl Bailey on 12/08/2010.